If your looking for great information about choosing the best electric standing mixer out there, then you have come to the right place. In order for you to be able to choose a good standing mixer that inevitably targets your personal needs and baking style you have to deeply navigate and earnestly step into the world of mixers, For your convenience and satisfaction, we have put together a list of the best 4 stand mixer brands. So if you are uncertain what is the best stand mixer to buy?! it is a good idea to go through the detailed reviews, ratings and comparison below; hope! it will help you to make your decision. Those who are serious about bread, dough baking and looking for a professional stand mixer that can handle almost every kneading and mixing tasks at the kitchen. This high-end stand mixer by ankarsrum, a Sweden manufacturer that has been in the business for decades and working to the highest standards in Europe. Also, a company that well-known for there high-end motors, ankarsrum made motors for many top-notch kitchen appliances out there and some of them for few Vitamix blender models, which another example to determine the high-quality of this stand mixer. Although this mixer is a little expensive as compared to other competitive brands, it still considered as a valuable choice due to its great kneading, mixing ability, build quality and by been highly recommended by restaurant chefs and homemakers. The ankarsurm feature a metal housing base and a plastic front panel with continuous speed control and timer knobs which very helpful for some dough recipes and the best part the feet of this stand mixer grips the counter and stay stable, no matter how fast the machine is running. A 7.4 QT stainless steel goes around mixing bowl that can fit 18 cups of flour or 5-7 loaves of bread and it comes with a roller attachment which perfect for basic dough and a hook for heavier ones, a dough scraper which can be assembled along with hook or the roller to scrap the sides of the bowl without stopping the mixer. and a yeast lid dough that can be used as a cover as the dough rises in the container and eliminate the needs to transfer the dough to another rising bowl or bucket. Additionally to another plastic 3/5 Quart bowl which used to be white but ankarsurm has just switches from making white to clear plastic. the bowl is made of BPA free Tritan and FDA approved material for a food and drink container. can be used with many attachments the can be bought separately, but the most used are the beaters and whisks. The motor the ankarsrum stand mixer feature a high torque 600-watt motor which ranges from 40-140 RPM, and automatic sensor to adjust the workload. the powerful motor allows the machine to knead even the most stiff dough without stripping gears, straining or moving around, and that makes it one of the best standing mixers for dough. And for those who are in love with attachments and accessories, the ankarsurm has added a power hub to the machine and plenty of attachment that can be purchased separately. so if you are considering to buy a KitchenAid stand mixer for the plenty attachments they had, here you have another option a powerful stand mixer and access to many high-quality attachments. Who it’s For? Experienced cooks or novice who plan on doing a lots of kneading and mixing especially heavy and dense dough. Powerful motor Does Not Slow Down When Dealing With Thick/Difficult Foods. a durable and high-quality home stand mixer for a reasonable price. let’s start with the 5-QT. Stainless steel bowl which I find it more than enough for any recipe, of course, I mean household recipes. ( allow you to mix 4-5 loaves of bread or 8-9 dozen cookies in a single batch). *But remember before first use you have to scrub the bowl extremely well to remove factory polish residues. I recommend to clean it with baking soda or salt. Okay, lets come to the tilt-head design which is the most common domestic stand mixers, The tilt head will give clear access to the bowl, make it easy to add ingredients to the bowl and to assemble/disassemble any attachments. But I noticed the tilt-head in the artisan is moving and jumping a little bit with stiff dough, but don’t worry all you have to do is to read the owners manual and make the necessary adjustment. The KitchenAid Artisan stand mixer 325-watt motor is powerful enough to handle any recipe or task without a problem, but the motor head will heat up with hard dough, high-speed or a long time running but this has never posed a problem. It has 10 speeds as advertised, but for me, there are only 6 speeds the ones that are highlighted on it 1,2,4,6,8,10, the other four which located between them, Is really difficult to feel any difference in speed. in addition to a soft-start feature, To prevent lightweight ingredients like flour to fly out of the bowl. The best part about owning a KitchenAid stand mixer is the wide range of attachments they give to you to cover every kitchen task from whipping and kneading to grinding and mincing. not to mention over to 20 colors to choose from, so you can pick the one that fit your kitchen. *always make sure you are buying the “new model” it has a better build quality than older models. The KitchenAid ksm150pser artisan stand mixer comes with a flat beat, dough hook, wire whip and pouring shield with chute all of them are dishwashers safe its an excellent feature for those who love to throw everything in the dishwasher. sold separately attachments: spiralizer, meat grinder, flex edge beater, and the 3 pasta attachments and many more, if you are into pasta make sure to check out our top pasta maker reviews. Who it’s For? Everyone who is looking for versatility on a top of performance. If you are looking for extra capacity and additional power and speed setting and of course access to all KitchenAid attachments this professional standing mixer is the best for you. The KitchenAid kp26m1xer stand mixer feature a 6 Qt stainless steel bowl, which more than enough for big batches and a comfortable handle to make lifting the bowl much easier especially when its full. (it can handle 12-13 dozen cookies or 12-14 cup of flour in a single batch). KitchenAid kp26m1xer stand mixer is a bowl lift design which opposed to a tilt head model, which makes it more stable and sturdy when mixing large batches and heavy ingredients. One of the features that make this stand mixer appealing is the adjustable lever that controls the height of the bowl from the beaters. Comes with a powerful and large 575-watt motor and 10 speeds to make the mixing processing much easier and smoother, and an electric speed sensor to determine the best setting for what you are mixing, in addition to overload shut-off protection. And a 67-point planetary mixing action, which means a 67 touch points per rotation around the bowl to grant full bowl coverage and perfect mixing. The KitchenAid kp26m1xer stand mixer Comes with 4 accessories: spiral dough hook, burnished flat beater, wire whip, and 1 piece pouring shield and there aren’t dishwasher safe. Who it’s For? Professionals and amateurs who want the best performance, large capacity and the most power. 575 watt powerful motor with 10 speeds. Over to 20 colors to choose from. 6-quart bowl to mix large batches. Doesn’t come with a bowl scraper attachment. Another high-end and stylish stand mixer offered by a well-known kitchen appliances manufacturer, whether you are a beginner baker or seasoned one you are going to love this stand mixer. Let’s begin with 5-quart stainless steel bowl which can be more than enough for most recipes. the handle I like the most about this bowl, which delivers a good grip and control when its full. In addition to bowl locking recess securely locks to secure that the bowl won’t move when the stand mixer in operation. A user-friendly vertical blue led above the speed knob to make it easy to control and choose between 12 speeds. And 10 minutes led timer with auto–off, can be programmed to count up or countdown. Breville Scraper Stand Mixer Pro designed and built from high-quality and durable die-cast metal. Which make it much lighter and sturdier than a lot of mixers, Breville has been generous with this model, they added plenty of handles, to provide an easier lifting or moving to the mixer over your kitchen, besides a handle to assist lifting the mixer head. Breville Scraper Stand Mixer Pro stand mixer comes with pouring shield, 5-quart bowl, wire whip, dough hook, flat beater, scraper beater and a thin spatula that is designed and shaped to scrape the bowl. And they are all dishwasher safe. Who it’s For? Cooks who value performance and power overall. 12 speeds electronic control ( via Led Screen). Plenty of lift assist handles. Only 3 colors to choose from. No attachments like the KitchenAid. Here are the top 4 best stand mixers on the market in 2019 according to our tests, now you should be able to pick the mixer that fits your baking style. 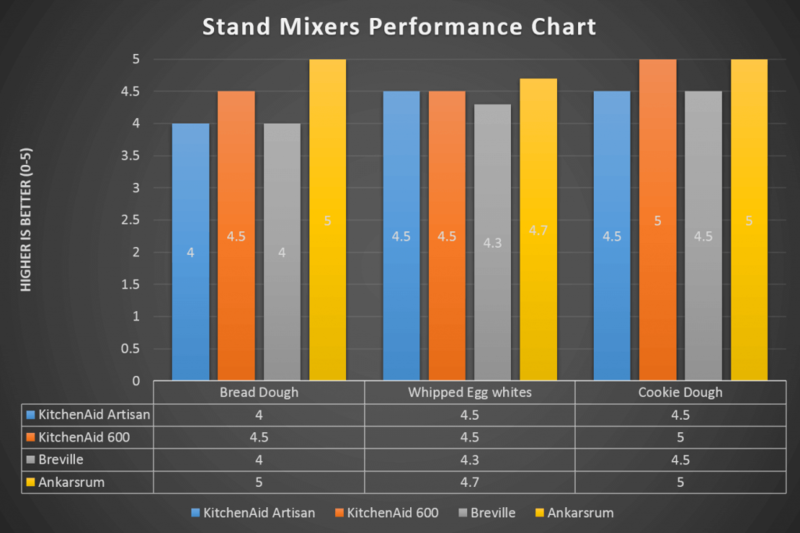 the KitchenAid Artisan standing mixers are by far the best performing mixer for the features and money. And if you look over, everybody recommending this home standing mixer, KitchenAid is really making a name for them self with this high-end unit. But if you are looking for powerful option; the KitchenAid Professional and ankarsrum stand mixers are the best options for you especially if you are working a lot with bread dough. but if you are looking for exclusive design and features then the Breville scraper stand mixer is your best option. Did I miss one of your favorite stand mixers? The greater the wattage, the more power the mixer will have, but actually when it comes to standing mixers wattage is not a reliable indicator of quality and strength. it’s better to base your decisions on torque (a measure of the rational force) the more the better, and on capacity how much flour the mixer can handle in a single batch. Stand mixer with a metal body, gears, and metal gear housing, tend to last much longer than the ones with nylon(plastic) gears. The more speed options the better, to allow performing any task from kneading dough at low speed to whipping cream at higher rate. at least a 6 speeds and slow start feature to keep all lightweight ingredients in the bowl and prevent them from flying or splattering your kitchen. Means the attachment move in one direction while the drive shaft moves the opposite one. planetary action deliver better scraping to the bowl side, besides a better mixing to the ingredients. Stand mixer tends to walk around your counter when mixing heavy and stiff dough, so always look out for a mixer that weight at least 20 pounds, to minimize it’s “moving”. Always consider the warranty that attached to each stand mixer, not only the length but what it is exactly covered. Actually, it depends on the size of the batches you usually bake, but always remember, it is possible to bake small batches in a large bowl, but impossible to bake big batches in a small bowl. A safety feature that turns off the unit before it overheats, to avoid any damage. * Speed options ( and slow start feature). *Kneading And Mixing a Different kind of dough. Both stand mixers and hand mixers got some excellent features and merits, but which one is better, it all depends on you, how much you are able to spend, how often and how you are going to use and your counter and storage space. If you are a casual baker which bake once or twice a month a handheld mixer would be enough which allow you to make small batches of cupcakes, whipping eggs, small cakes and buttercream. but if you are a keen baker a stand mixer is more recommended especially if you deal a lot with pastry. which is more versatile and powerful. Lets a look at both mixers pros and cons, so it could help you to decide which one fits you even more. Powerful which allow you to deal with thick mixtures. Not as convenient for small batches. Lack Power with big batches and thicker mixtures. Cant be used for mixing dough or pastry.